There are many available choices for snowshoeing footwear. With all outdoor activities, the footwear has to function properly. In purchasing equipment for the outdoors, I always use the same thought process. How often am I going to upgrade my equipment based on the new radical improvements that the manufacturer will come out with? How long before my existing equipment will become obsolete and I will have to replace it? How long will it be before I have a disadvantage with my existing equipment? When the time came to choose snowshoeing boots, I decided that I would choose the best snowshoeing boots that I could afford based on the use of the boots. Depending of where you will be snowshoeing, how long you will be snowshoeing, how far you will be snowshoeing and what conditions you will be snowshoeing, you always run the risk of being in a dangerous situation. Cold weather as well as snow storms could make your easy hike turn into a situation that needed warmth. A heavier and warmer boot would be recommended instead of a lighter and less warm boot. What will you be doing: walking, running, climbing or a combination of all activities? What is your level of exertion? Will you be backpacking over multiple days or just day hiking? What type of snow will you be hiking through - powder, heavy snow or snow crust? 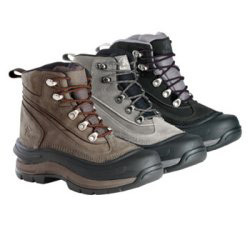 You can choose leather boots, plastic mountaineering boots, snowboarding boots or even running shoes. Since the snowshoe bindings fit most types of boots, you have a large selection to choose from and you may already own boots that are comfortable as well as work well with your snowshoes. The best boot is a boot that flexes at the ball of the foot. Make sure that the boots you will keep your feet dry. If the boots are not waterproof, winterize your boots. These are the most important features to ensure that you will have an enjoyable experience. If one of those features do not hold up, you will have an unpleasant experience. If you need a boot that is stable because you are snowshoeing long distances and are going up steep grades, you will be disappointed in a real flexible boot. What type of boot would you choose to hike if you were going that distance without snowshoes. Your boot choice would probably be the same choice as when you are wearing snowshoes. Even though it is quite easy and possibly less expensive to purchase snowshoeing boots on the Internet, there is no substitution for trying on the boots. Always wear your boots before purchasing a pair. You should layer your socks in the boots (lightweight, wicker as the first sock layer and then a sock that fills the boot to keep you warm (lightweight, medium, heavy). You can also use a neoprene sock, too. Don't make the layers so tight that it restricts the circulation in your feet as it will lead to cold feet. With layers, this will be just as warm as a thick leather boot. Make sure the back of the boot has a notch so that the binding will be able to grab the back of the boot. This will stop the binding falling off the back of the boot. The boot is not a fashion statement so pick the boot that works the best. No one is going to be looking at your boots when you are out on the trail. But they will be looking at your boots if you are sitting down on a log with your boots removed and you are rubbing your feet trying to get them warm or trying to get the circulation back. You might already have a couple of pairs of boots that will work quite well. When you are purchasing your snowshoes, bring the boots in to see if they will work properly. There is no substitution for having boots that are already broken in. Don't forget that you will also be wearing gaiters over your boots to keep you dry and comfortable. Don't forget to learn how to maintain your snowshoeing boots correctly because incorrect methods might damage your showshoeing boots and choose showshoeing boots wisely.